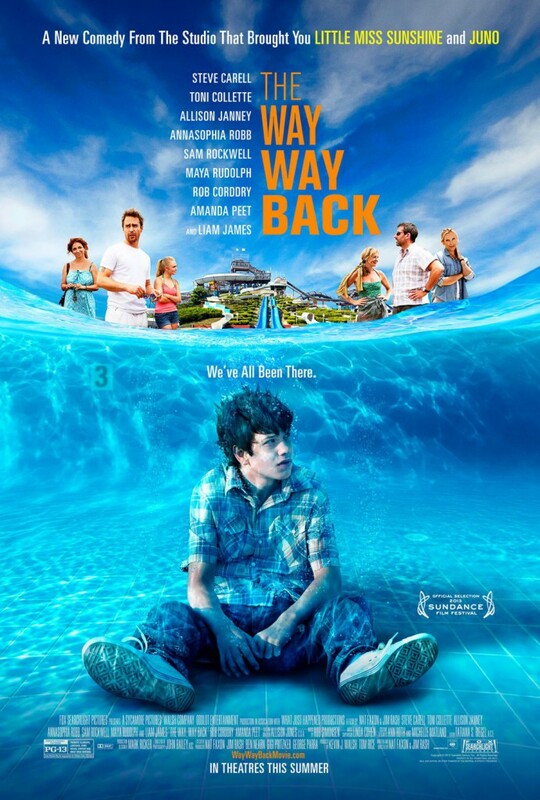 Steve Carell and Sam Rockwell both have the ability to be really funny and that is why I thought that The Way, Way Back could be hilarious. If both of those guys are in the same movie together than it is bound to make you laugh right? The movie is about Duncan, a timid 14-year-old boy (Liam James) who is dragged along on a summer vacation with his mother (Toni Collette), her jerk of a boyfriend (Steve Carell), and her boyfriend’s daughter (Zoe Levin). In order to escape the awkwardness, Duncan ventures off on his own to a nearby water park where he befriends Owen (Sam Rockwell) the manager, and gets a summer job. 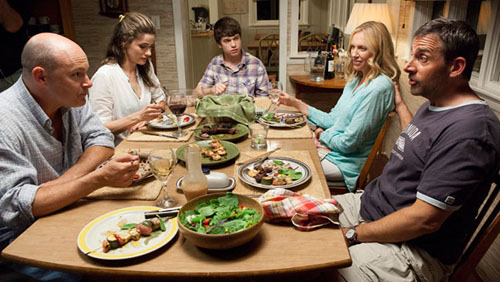 The film was written and directed by Nat Faxon and Jim Rash. The rest of the noteworthy cast includes Allison Janney, Maya Rudolph, Rob Corddry, Amanda Peet, River Alexander, Nat Faxon, and Jim Rash. The film did not have a very promising start, and I was worried that it was not going to get any better. It was a stale dysfunctional drama until Sam Rockwell made his appearance and saved the day, and the movie. Rockwell turned the film into a “dramedy” and made it worth watching. The film literally went from awful to entertaining as if Rockwell had just flipped a switch. Unfortunately, Carell’s character was not funny at all. Carell is usually pretty excellent when he is in a comedic role, but when his character is all drama, he is hardly likable. The movie was a good story of how uncomfortable life can be sometimes with a divorced parent who is dating again. Maybe being a child of divorced parents myself, I related to the movie a little bit more than others might. When you are a kid who is stuck dealing with a boyfriend or girlfriend of one of your parents whom you just don’t like or get along with, it is nice to be able to escape with your friends for support. I was fortunate enough to be able to do that many times during my childhood. That is what this movie is about and that is what this movie does a good job depicting. It’s not the funniest movie in the world and it’s not the greatest, but it is a touching story that should make you laugh. Buy, rent, or run? Rent.